we crossed the Arctic Polar Circle on the way to Kolyuchin Island. During the morning at sea Alex gave us an introduction to the botany of the Arctic and Katya spoke about Polar Bears in a changing world. During lunch, the expedition crew went scouting the buildings of the old research station on the northern tip of Kolyuchin Island to make sure there were no Polar Bears in the vicinity before our afternoon landing. None were about, so after lunch we dropped our five Zodiacs and approached a group of walrus on the other side of the island. We slowly approached the haul-out, and some of them came close to investigate us. It was fantastic to see them so close! Soon after the walrus show we landed on the northern tip of the island where we spent few hours exploring the area around the old research station. The highlight of this area was without doubt the high bird cliffs. 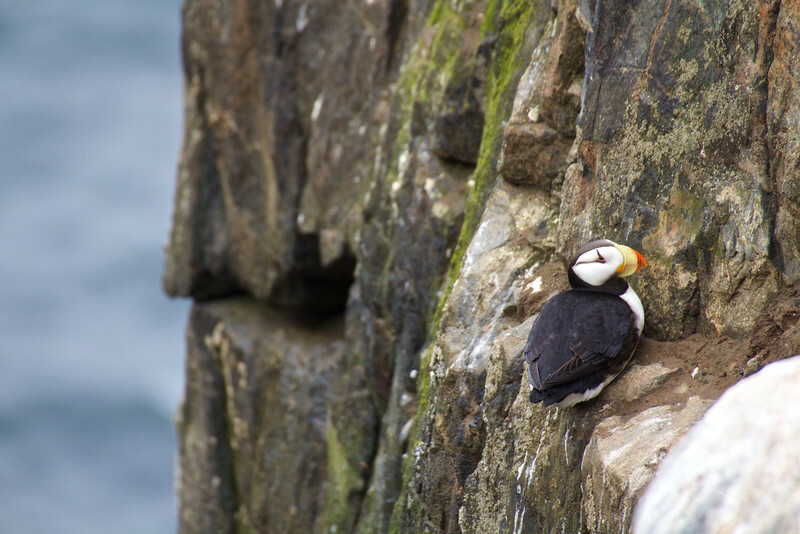 Thousand of Kittiwakes, Brünnich’s and Common Guillemots, Pelagic Cormorants and both species of Puffins (Horned and Tufted) were breeding there. Most of us were seated on the edge of the cliff taking photographs and just enjoying watching the lively activity! Out to sea we could make out two or three Humpback Whales feeding.